As the Union army occupied Southern territory, it began to devise policies to deal with the transition from slavery to freedom, and the interrelated questions of access to land and the organization of free labor. Many of the issues central to Reconstruction were fought out on the Sea Islands of South Carolina, even as the Civil War continued. The most famous "rehearsal for Reconstruction" took place on the Sea Islands just off the coast of South Carolina. When the Union navy occupied the area in November 1861, the white population fled, leaving behind a community of some 10,000 slaves, who believed freedom meant access to land and the ability to direct their own labor. 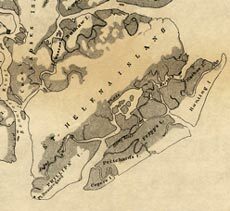 Map of St. Helena Island, South Carolina. from a map: Coast of South Carolina from Charleston to Hilton Head. by the United States Coast Survey. 1862. Their aspirations soon brought them into conflict with new arrivals from the North -- Treasury agents hoping to restore cotton production, investors seeking to acquire Sea Island land, and a group of young reformers, known as Gideon's Band, who sought to assist the freedpeople by providing education and preparing them for the competitive world of free labor.